In this lesson you will learn how to apply question answer choices, standards, question groups, and other attributes across multiple items of the same question type. This action will wipe previous settings and replace with newly applied settings. This cannot be undone. Select New to Create a New Flexible Assessment. You will need at least 2 questions added to the assessment to use mass apply questions. Select the questions you wish to change. Review the number of selected questions displayed. Choose Answer Choices for all questions selected. Enter a Weight or points for each of the selected questions. Select and choose Question Groups. Only when changes are made, will Apply Changes will be available. Select Apply Changes to continue. What If I Don't See Options to Edit? When selecting items of different item types, you may notice that the options are not available. For example, above MC and CR items are selected to Edit. Answer Choices and Weight are not available to change for the selected items. However, you can mass apply Standards and Question Groups these questions. Explicit Constructed Response and Constructed Response Advanced cannot mass edit iAnswer Choices or Weight. Due to the nature of these items, they are to be set individually. However, you can apply Standards and Question Groups to these questions. Multiple Choice Advanced cannot mass edit Weight. Due to the nature of these items, they are to be set individually. However, you can apply Answer Choices, Standards and Question Groups to these questions. Select Back toi return to the previous screen and continuing editing. To continue, select Apply Changes. Because these changes will replace current settings, we ask to confirm one more time with Yes I'm sure. Made a mistake? You can edit the question settings individually by reviewing Creating a Flexible Assessment. 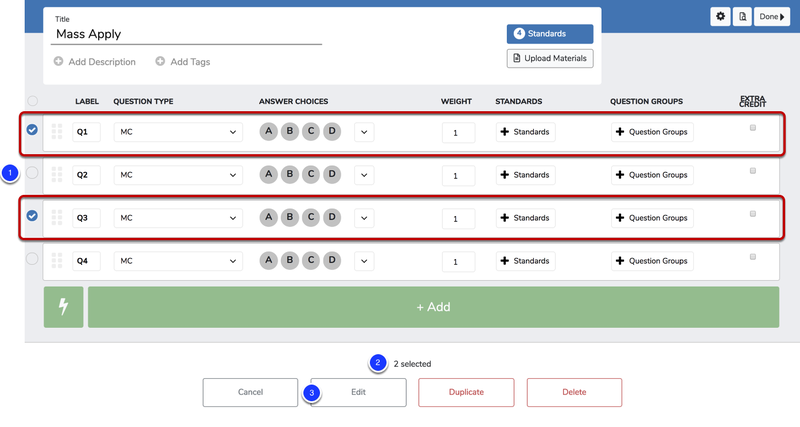 Learn how to duplicate questions by visiting Duplicate Questions in Flexible Assessments.